The slice backhand can be a great tool for many different reasons. It can be used in transition to approach the net or when keeping the ball low and allowing time to get into a good volleying position. It can also be used to mix up the pace during a rally to throw off the opponent's rhythm and force an error or a short ball. And it can be a fantastic tool on defense to buy enough time to get out of trouble and back into a point. For all of these reasons, having a slice in your arsenal is a big advantage when you go into battle. The backhand slice technique can be tricky because it requires a certain amount of touch and feel. The traditional grip for a backhand slice would be a continental (the same as for the volley), but some players will vary this slightly depending on what they are more comfortable with. Turn your shoulders and bring the racket up with the hitting surface of the racket open. Be sure that the elbow is bent and you are not too stiff when executing your slice. This is a common problem and can lead to frustration when trying to learn the slice. 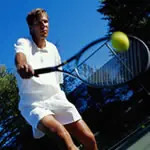 From this position, swing the racket forward and slightly down to the ball, sliding the face of the racket under the ball. Don't make the swing pattern too steep or you will look like you are chopping down a tree as your slice bounces two feet short of the net. Swing more out to the ball. Contact should be slightly forward of your front foot. If you are too early, the ball will go straight up, and if you are late, the ball will most likely come off too flat and sail long or wide. The finish should be with your hand about shoulder high and your racket completely open. Be careful that your body stays turned throughout the stroke. It is common to see some inexperienced players finish the slice with their body completely open and parallel to the net. You should try to remain turned until the slice is finished. Don't expect great results on your first few tries. As I said, this takes a certain amount of touch and control. When learning the slice, practice short on a wall or from service line to service line with a partner, going slowly and learning to feel the ball. As you begin to feel more comfortable, slowly move back until you are hitting from baseline to baseline. If the ball is coming off with too much spin (or thin as we call it), try getting more of the ball on the strings on contact and make sure you are not chopping down on the ball. If the ball is too flat off your strings, be sure the face of the racket is open and slides under the ball on contact. Another common problem is the ball going too high. If this happens, try speeding up the racket head slightly on contact. This will help the ball "grab" the strings and keep the ball from going straight up after contact. A coach can be a great help with your technique, but the only way to really get the hang of the slice is to practice it over and over. A coach can teach many things, but they cannot teach feel. That is something you must master on your own. As the saying goes, "Repetition is the mother of skill." And it is never more true than when learning the slice. 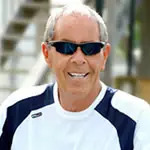 Nick Bollettieri founded the IMG Bollettieri Tennis Academy in 1978, the first full-time tennis boarding school to combine intense training on the court with a custom-designed academic curriculum. He has coached 10 players who have reached No. 1 in the world, including Andre Agassi, Boris Becker and Martina Hingis. To learn more, visit IMGAcademies.com.